Advanced Dentistry of Scarsdale provides a wide variety of services related to cosmetic dentistry and more. We have years of experience placing dental implants with different kinds of materials so you can get the one that works best for you. We will listen to your situation and give you individualized care. You can trust you are in good hands with our experienced periodontists! Dental implants are metal posts inserted into the jawbone below the gums. These dental implants provide a strong, stable foundation to attach an artificial crown. These implants creates a root so so the crown lasts longer. The implant keeps artificial teeth strong and can last a lifetime. What are the Two Main Types of Dental Implants? Endosteal implants: This is when your Westchester periodontist inserts the implant into your jaw. Then, after it heals, he will perform another to connect a post to the implant. After that, your prosthodontist will connect an artificial tooth to the post. Subperiosteal implants: This method inserts a metal metal frame into the jawbone below the gums. Then your periodontist attaches a post to the frame, sticking out from the gums. This post is where your prosthodontist attaches the teeth. Dental implants come from two different kinds of materials in most cases. These materials are titanium and zirconia. Around 95% of dental implants use titanium. Titanium implants are common because they are versatile. They can use either a one-piece system or a two-piece system. This means that your Westchester periodontist can use different methods with titanium materials depending on the patient. Zirconium is also another safe option, if you happen to be allergic to tianium. 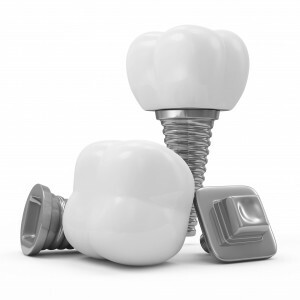 Dental implants come from two different kinds of materials in most cases. These materials are titanium and zirconia. Around 95% of dental implants use titanium. Titanium implants are common because they are versatile. They can use either a one-piece system or a two-piece system. This means that your Westchester periodontist can use different methods with titanium materials depending on the patient. Zirconium is also another safe option. Advanced Dentistry of Scarsdale offers dental implant services to all of Westchester NY. Give us a call to find out more or schedule an appointment. Our staff are all friendly and happy to help.